I made these cupcakes for my friend's birthday. Very simple, classic recipe, but made with the best ingredients I could find. They were a hit at the party. 1. Measure out everything but the eggs directly into your mixer bowl. 2. Mix on low speed just until incorporated. 3. Beat on high speed for 2 minutes. 4. Add eggs, beat on high speed again for 2 minutes. Measure out into cupcake pan lined with cupcake papers. A 2" ice cream scoop works great for this. Bake for about 15-20 minutes until a toothpick comes out clean. Let cool slightly in the pan then transfer to a rack to cool completely before frosting. 1. Beat butter on high for about 30 seconds until soft. 3. Add half of the milk and the remainder of sugar and beat until incorporated. 4. Continue to add milk until you get to the consistency you want. There are many ways to go here, in this case, I simply piped the frosting onto the cupcakes with a large star tip. Yummy! These look rich and I bet they were delicious. I keep using this recipe and I love love love it. Why would anyone use a cake mix when this recipe is just as easy and lacks weird chemical ingredients. I'm from Australia, and was wondering what exactly a stick of butter equates to? I'd love to try this recipe with the icing! One stick is four ounces. Hope that helps. i just made these for an impromptu valentine's dinner, and i have to say, i got nothing but compliments. thanks for the great recipe! Thanks! I tried these yesterday - yum! I really enjoy your site. I think I'm going to try these cupcakes with a lime cream cheese frosting (since I love the combination of dark chocolate & tart citrus). I felt satisfied just looking at those happy faces when they eat these cupcakes. Just made these cupcakes -- just the cakes, not the frosting -- and while I loved the pillowy texture and shape, they tasted kind of flat. Wondered if a pinch or two of salt would help sharpen the flavor? 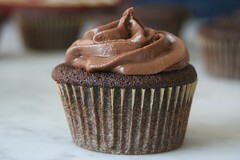 Was wondering if you have tried the Devil's food cake recipe from the Magnolia Bakery cookbook? I tried it today and was quite disappointed. The texture was good but the taste was pretty blah and not very chocolatey. Sigh, I have had a disaster with these cupcakes. All sunken. Wah. I was making them for my son's b'day party tomorrow. I decided to cut my losses and just bought the 30 cupcake platter at Safeway. They're only 4 afterall. The cupcakes totally rocked my world! I have made them twice in the past 3 weeks. Chocolate good, good, good! Now I've got to try the chai spice. The hubby is a choco fan but chai is right up my alley! Very tasty to make. Very yummy to eat!! My first cupcake ever! I'm just wanted to say thanks for this recipe--I am not by any means a cook/baker, but I made these for a birthday party, and they were loved by all! I changed the frosting a little bit to one I'd already made--with whipping cream instead of milk, and a little bit of vanilla. Deelish! Just wanted to say thanks for the fabulous recipie! I made these today and they are awesome. Needless to say, there are very few left now. Must go make some more! hi there! your cupcakes look really pretty, making me want to try this recipe! for the cocoa stated in the frosting recipe, are you referring to unsweetened cocoa powder, the same type used for the cake? yes, that is exactly it.